The memorial is dedicated to citizens of Surry County who sacrificed their lives during the Great War. A large, grey, stone sculpture has a large pointed feature in the center that contains the carving of a cross under which an eagle carrying arrows and olive branches in its talons. The sculpture has two square pillars attached to either side of the pointed center piece. On these pillars the names of the Surry County World War I veterans are inscribed. The names of white and black servicemen are listed together. A 1932 postcard shows the north side of the Surry County Courthouse and surrounding area where a few years later (1939) the memorial will be built. Money was raised by a school drive directed by Members of the Former Board of Welfare: W. F. Carter, A. H. Wolfe, E. S. Hendren and Members of the Board of Welfare at the time: W. M. Allen, John Llewellyn, and Mrs. R. J. Lovill. Approximately 5000 men and women gathered on the lawn of the Surry County Courthouse to celebrate the unveiling of a new Veterans memorial in Dobson on November 11, 1939. Keynote speaker at the event was former Governor J. C. B. Ehringhaus. Ehringhaus was introduced by Mount Airy Judge W. F. Carter. Ehringhaus was followed by John H. Folger, a Surry County attorney who appeared on behalf of his brother, Congressman A. D. "Lon" Folger. Also included in the event was an unexpected speech by former Lieutenant Governor R. A. Doughton. All of the speakers advocated for the peace effort and their hopes that there would never be another World War such as this. The monument was unveiled by former Surry County student Mrs. Alma Calloway McCollum, who was introduced by A. H. Wolfe following his explanation of the history of events leading to the monument. 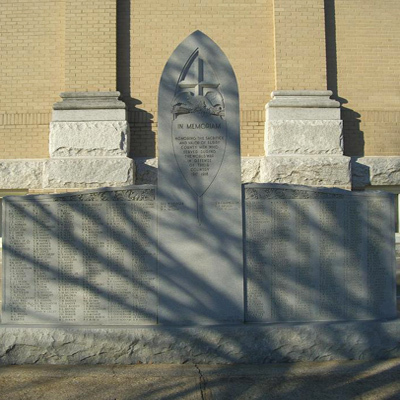 The World War I Memorial is located on the north side of the Old Surry County Courthouse at 141 Main Street, Dobson, NC 27017. The Surry County War Dead and Confederate Soldiers monuments stand on the front lawn (east side) of the building. The memorial complex sits on a paved walkway surrounded by grown trees. A flag pole is a few feet from the monument, closer to the street.